Well, now we're opening the can of worms that is the various iterations of the Borg character. Obviously the TNG Borg as well as the VOY Borg were capable of understanding things communicated to them; my point is more toward the fact that TNG Borg were, if not incapable of any sort of political or diplomatic relationship, completely lacking in both interest and need for such. VOY Borg were different, cf. Species 8472. That would be the primary, if not only, benefit, but not necessary to achieve that benefit. Remember when Korea was a single nation? 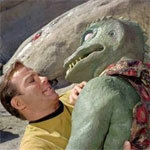 Mikey wrote: Well, now we're opening the can of worms that is the various iterations of the Borg character. Obviously the TNG Borg as well as the VOY Borg were capable of understanding things communicated to them; my point is more toward the fact that TNG Borg were, if not incapable of any sort of political or diplomatic relationship, completely lacking in both interest and need for such. VOY Borg were different, cf. Species 8472. Well, even the TNG Borg decided to create a special kind of drone to "facilitate our introduction into your societies" and "speak for us in all communications". We're never told what that means in detail, but they clearly intended to do something other than just assimilating everyone on sight regardless of consequences. Honestly the idea of the Borg as unthinking machine people with no interest in anything but assimilation didn't survive past the first episode. But I'm not suggesting that you could negotiate with the Borg, or sign a peace treaty or whatever. Just that you could deliver a declaration of war before you attacked them. We talk about almost an era ago. I do not know how many European nations have formally declared war on the African countries during the colonization of Africa, I do not think they were reputed as equals, and nobody considered it an affront to international law. Italy had to do it with Ethiopia but because this was part of the League of Nations (It sounds very DC Comics ^_^), and colonialism was already in decline. Honestly the idea of the Borg as unthinking machine people with no interest in anything but assimilation didn't survive past the first episode. It was an extremely original feature for the time, but hard to sustain in the long run I think. If we think of the replicators of SG1 (which have a lot in common with the Borg, they are almost a copy ...) even these after a few episodes have been humanized. It would be interesting to know how they would communicate it to them, assuming they did. Subspace? too far (at least until late Voy episodes). Long-range probe? by the time it reaches the Borg space the war could be over. bladela wrote: but hard to sustain in the long run I think. Hard to sustain after October 24, 1991, that is. The Borg as that totally alien machinistic and amoral "species" was exactly Roddenberry's vision for them, although nobody else's. The Borg... sigh. Such an evil race, or at least the idea of them is. Robot zombies! Oh no. When Q tossed Enterprise into their area, they are only interested in the ship and technology (or rather salvaging materials by using the force... heh. “It’s as though some great force has scooped up the all the cities”, what tool/weapon was this anyway? They are never seen using anything that huge?? Cutting lasers, tractor beams, green photon torpedo-looking projectiles, green shield draining energy balls, and green phaser-like energy beams. Scooping up entire cities+plus enough ground around it to look like a meteor impact ((best of both worlds part 1- visual in front of the beamed down away team) would’ve been impressive to see!). Continuing, the Borg transwarp hub was something I know was used as a plot convenience to get voyager home. It has bugged me though as I’m sure it has others. If the Borg has this technology/ability (seven of nine knew about them pre-removal from the collective as if all six were in use and they were already the borgs primary transportation to distance areas of the galaxy? Plus, the Borg were (apparently) already bored with exploring and assimilating our galaxy and had already been looking into alternative dimensions and different levels of subspace. What has bothered me from the introduction of the hubs is that it negated the fear of, “they are coming”, the show spent so much time generating? Having the Borg space soooo far away meant that it would take years for them to travel to the alpha and other local quadrants to being assimilation in this corner of the galaxy. The Borg were even eager to come to the local area and get some more of that yummy federation technology! They have lots of ships to spare in the delta quandrant as mentioned and shown in VOY: scorpion. They can easily send 30-40 ships (w/tons left over) to earth and wipe out any resistance. But man.... what a long trip. Not worth the effort atm right? Fast forward to the transwarp hubs and now it feels like, “long trip? Pfft we can send a dozen cubes right into earths backyard in less time than it takes to reconfigure a deflector dish to open a fluidic-space opening!”. The distant long term arrival of the Borg is erased, their max speed is irrelevant now, and they can come and go anywhere in the galaxy when they want to with little to no effort. Put simply, instead of the Borg being a threat, they are more of an otherwise occupied conquering force. They could show up at anytime now, they just haven’t gotten around to it yet. Don’t even get me started on the whole “Borg maturation chamber” issue either. Seven of nine states that Borg are not created this way when her nanites infect the doctors mobile emitter and sample Babcock’s DNA to create a 29th century drone. When the borg are first shown, Riker opens the drawer/crib and sees a infant drone. He hypothesizes that they are born and immediately integrated with cybernetic implants. Where did the babies come from if Borg do not reproduce this way and only assimilate, why did that cube have babies on-board?? 00111010 01000100 wrote: Fast forward to the transwarp hubs and now it feels like, “long trip? Pfft we can send a dozen cubes right into earths backyard in less time than it takes to reconfigure a deflector dish to open a fluidic-space opening!”. The distant long term arrival of the Borg is erased, their max speed is irrelevant now, and they can come and go anywhere in the galaxy when they want to with little to no effort. Put simply, instead of the Borg being a threat, they are more of an otherwise occupied conquering force. They could show up at anytime now, they just haven’t gotten around to it yet. What if that transwarp technology is a really recent assimilation? maybe at the time of tng their ships were limited to some very high warp speed (let's say....warp 9.99+) ..The federation was a good target...but not so good (their technology in the galaxy level was only average...think about the Voth in comparison). bladela wrote: What if that transwarp technology is a really recent assimilation? maybe at the time of tng their ships were limited to some very high warp speed (let's say....warp 9.99+) ..The federation was a good target...but not so good (their technology in the galaxy level was only average...think about the Voth in comparison). The Borg cube has to maintain itself over a long duration, plus having the right equipment for planetary assimilation. They have enough volume/power generation to easily deal with the Enterprise, but could also have a lot of other equipment, so for a change the Federation vessel has more armament in its mass than the enemy. Think of Enterprise vs a Borg cube like a PT Boat vs a Battleship. A PT boat might have more armament per ton, but the Battleship still has the heavier guns. The Borg Cube vs Enterprise might have been willing to accept a little more damage in order to get more information.